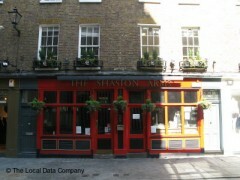 About: The Shaston Arms is a pub that serves a variety of beers, wines, spirits and traditional pub dishes. They also have seating in the garden area. "No-frills pub that does what it says on the tin"
It can be hard to swing a cat of an evening in most Soho pubs and bars. Luckily Shaston Arms, tucked away as it is on Ganton Street tends to have a little more breathing space during the week. The old fashioned booths are particularly welcoming. This small, cosy pub does however get packed towards the end of the week with after-work drinkers, who tend to spill out onto the pavement. In fact, the staff behind the bar ask customers whether they are outside or in, and serve drinks in plastic cups accordingly. The bar itself is tiny – which can extend waiting time on busy nights - and the selection of drinks on offer is small yet perfectly formed, with lagers and Badger Brewery ales on tap, including the very fruity Golden Glory. Food isn’t served, so if you’re peckish a packet of crisps will have to suffice. Despite its traditional appearance this pub was a wine bar up until roughly ten years ago. Old photographs of Soho on the walls and wooden floors help to make the pub look a little ‘worn’. A no-frills pub that does what it says on the tin. Pleasant pub. Good staff. Badger and Tanglefoot beers are good. Quiet location yet handy for West End.